This is the 3rd installment in our In Transition series where we explore the role and benefits of fuel cells and hydrogen energy for sectors in transition to a more economically and environmentally sustainable future. The International Maritime Organization (IMO) is a United Nations agency tasked with ensuring “safe, secure, and efficient shipping on clean oceans.” IMO estimates maritime shipping contributes over 1 billion tons of CO2 per year, which is 2-3% of global emissions. Without action, IMO predicts a 250% increase in greenhouse gas emissions by 2050 due to increased shipping in a more globalized economy. Recognizing this, in April 2018, the IMO adopted an Initial Strategy resolution to significantly reduce greenhouse gas emissions from international shipping. By 2050, according to this resolution, the goal is for the international shipping industry to reduce greenhouse gas emissions by at least 50% from 2008 levels. Meeting these goals will require an aggressive transition away from diesel power. In light of this, hydrogen powered-fuel cells are now being considered in order to provide a sustainable transportation option for the international shipping industry. There are a number of current and planned demonstrations underway to advance fuel cells and hydrogen energy for shipping propulsion, which could play a significant role in meeting emission. 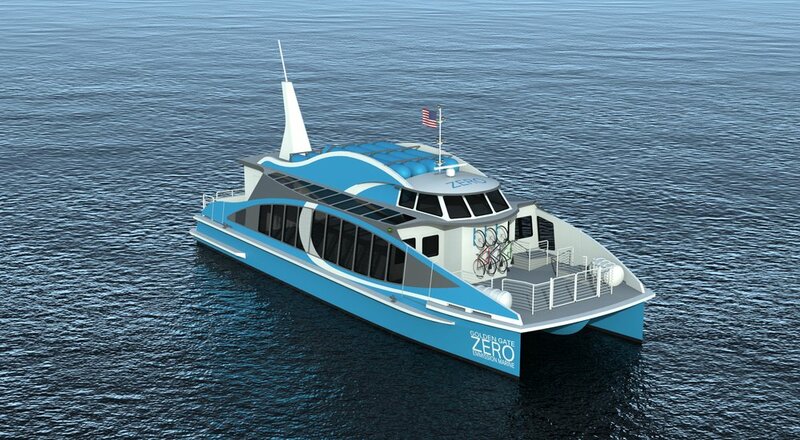 The “Water-Go-Round,” a fuel cell-powered ferry, will be the first fuel cell-powered boat produced in the United States. The “Water-Go-Round”, which is projected to hit the waters of San Francisco Bay in autumn 2019, will be able to store enough hydrogen to run for up to two days between refueling. The 70-foot-long aluminum catamaran will boast a top speed of 22 knots (about 25 mph) and have room for 84 passengers. Bay Ship & Yacht Co. of Alameda, California will build it, using dual electric motors from BAE Systems and a set of fuel cells from FCHEA member Hydrogenics. It will refuel from hydrogen-carrying trucks, not requiring any special dock-side infrastructure. Since its voyage was launched in 2017, FCHEA member Toyota has been a main partner of the Energy Observer, a marine vessel powered by renewable energies and hydrogen produced from seawater. The Energy Observer is in the middle of a cruise around the world, the first of its kind taken by a hydrogen-powered ship. FCHEA member Air Liquide is also an official supporter and FCHEA has tracked the Energy Observer’s journey since it began. You can follow its circumnavigation on Twitter. Recently, HYON AS, a joint venture between FCHEA members Nel and Hexagon Composites, and PowerCell Sweden, received an approval-in-principle from DNV GL of their module-based fuel cell solutions, adapted for maritime use. The module-based designs can be installed above or below deck and range from 100 kW to multi-megawatt fuel cell power systems, allowing for large-scale, international shipping applications, cruise vessels, work boats, and offshore vessels. The HYON/PowerCell solutions are also significantly smaller and lighter than diesel or gasoline-fueled marine power generators of equal power output. Joi Scientific Inc. has signed a license agreement for its hydrogen production technology with MarineMax, the world’s largest boat and yacht retailer. The license agreement grants MarineMax the exclusive rights to develop, manufacture, and sell propulsion and auxiliary boat power systems capable of running on hydrogen extracted from seawater using Joi Scientific’s hydrogen technology. 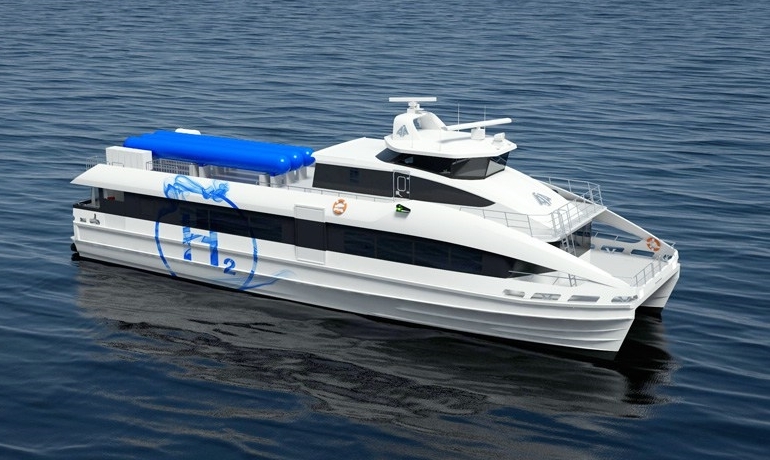 With increasing pressure for shipping to reduce harmful emissions, fuel cell and hydrogen energy technologies are poised to enter these waters and further develop, as projects utilizing hydrogen technology are already under way for ferries and high-speed vessels. Cruise vessels with fixed routes, work boats and offshore vessels are other examples of ship segments where hydrogen is well matched. The future of the maritime shipping and transportation industries can be green and sustainable, with fuel cell and hydrogen technologies.